Our Mothers Day tradition is to all meet at a local park after Church and have a brunch. Last year when we arrived at the park there was a group of bagpipers and drummers rehearsing at the park. We were quite excited to have some entertainment — but an hour later our ears were tired and we couldn’t wait to escape! This year we decided to gather in my youngest sister’s house instead of the park. Mom made a breakfast casserole with eggs, potatoes, bacon, sausage and cheese – my cholesterol level soared just looking at it!! My brother-in-law had a bottle of Champagne and orange juice so we had “Mom-mosas” which we decided will be our new tradition! 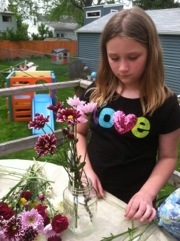 I thought it would be fun to do a little Mothers Day craft with my daughter and nieces. 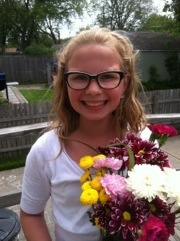 I bought a variety of inexpensive fresh flowers from the wholesale flower store. 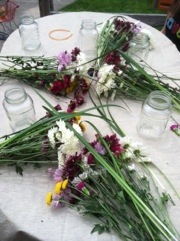 Then I gathered some canning jars – one for each of my 4 sisters and my Mom. 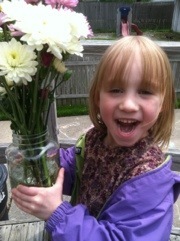 At my sister’s house I set up each of the girls (the boys weren’t interested) with a jar/vase and a pile of flowers. 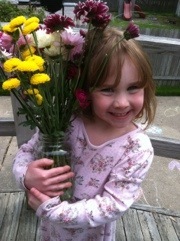 They each arranged a bouquet to give to their Mom or Grandma. 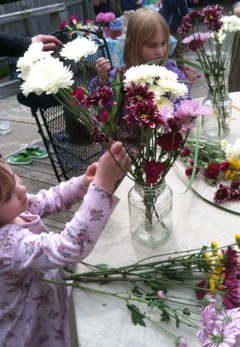 They enjoyed arranging the flowers and then ran off to play when they were done. I called them back to take a photo and to have them give their arrangement to their Mom. Later that day my husband gave me a bag of cement as a Mothers Day gift – the perfect gift! I have been wanting to experiment with Hypertufa and now I have everything I need. Hypertufa – had to google it, new word to me. Can’t wait to see what you do! 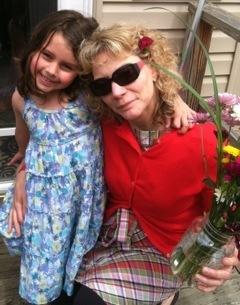 Great pictures of flowers, daughters and moms! BTW, I made a couple hypertufa pots a few weeks ago. If you’d like to make one out here, let me know. I have the portland cement and fibermesh.